The folk at Karben4 are awesome. They love what they do and create an amazing experience. 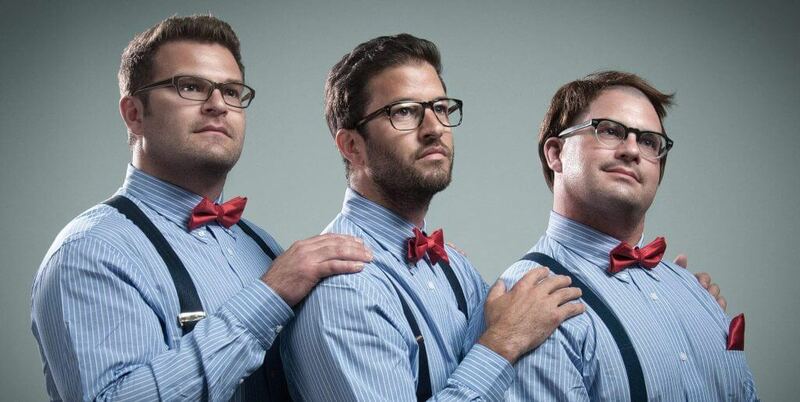 To them, it’s more about telling stories with their brand and their beer. Their website is a poignant example of that. More importantly, however, their beer is often the first thing people will encounter so it needs to stand out. With Fantasy Factory, they introduced the world to a video-game + rock’n’roll 80s aesthetic that was the branding equivalent of a home run. But how do you reliably reproduce that experience? We have the privilege to work with Karben4 on many projects. 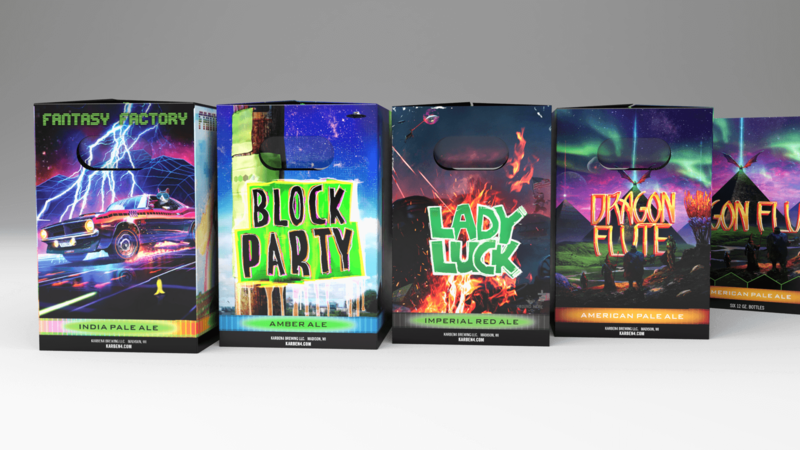 In particular, we created their new website and we put together their beer packaging. We take the amazing artwork of Jason Heuser and transform it to fit on the packaging templates provided by the printer. Phil does this as well as reorganizing and creating new design elements from Jason’s ‘paintings’ to better fit on the physical media. He takes a flat rectangular painting, and figures out how to best utilize the design on a three-dimensional project. 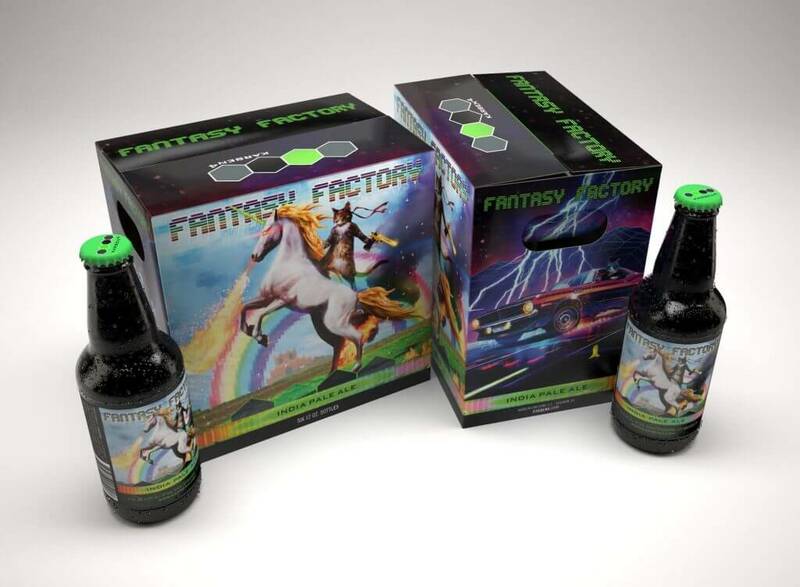 A 3D rendering of Fantasy Factory box and bottle. Once Phil has developed the artwork to fit on the box template, he gives it to Jeff for rendering. Jeff, our 3d graphics and editor extraordinaire, takes the template from Phil and applies them to the amazing 3d models he’s created. They’re so real the renders look like pictures. The renders are inch-for-inch the same as the physical product and in many cases, the models are created from the printing templates. We then share these renders with the client. They’re so photorealistic that it’s easier to order the prints with a confidence not possible with just 2d graphics in a box template. This allows Karben4 to better manage and maintain their unique aesthetic without wasting time and money going to print until everything is perfect! We think critically, on every project, on how best to serve the client. It was an idea I had which, once communicated, was completely obvious. Now we have a pipeline set up so within a matter of minutes we can share design changes in a photorealistic render to better inform design choices. This entry was posted in Graphics, Website and tagged 3d graphics, 3d studio max, rendering. Bookmark the permalink.